Floormatshop.com offers many different types of logo mats, each with their own styling, features and options. Custom Size mats are available when indicated in the "Sizes Available" table on each custom mat page. Indoor Logo Mats are typically called Wiper Mats made for removing additional dust and debris. 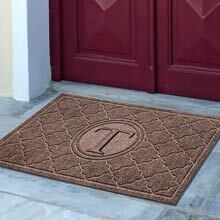 These Custom Floor Mats are primarily used inside but may be used outside (when indicated). Custom floor mats should be used in conjunction with a Scraper Mat and a Wiper Mat for maximum dirt removal performance.